Vintage McCall's 9507, View A (sort of), dated 1968. AKA Jillian makes another Pirate shirt. Oh alright, it's not quite that bad, but it's not my most favourite make either. It does have poofy sleeves, ridiculously wide cuffs and ruffled neckline. It's pretty damning evidence of a pirate shirt. I do worry it makes me look like a Pierrot-inspired pirate clown. I sewed a straight Size 12 with no modifications to the sizing. I did, however, eliminate the ruffled patch pockets (they were absolutely huge!) and the ruffle at cuff. I mean really people, there is only so much ruffle one person can wear! These are some seriously wide cuffs! I decided to add some interest by using cream thread for the buttonholes and navy/royal blue for the button thread. I like that it picks up the blue in the print, which you almost miss. And the print! Teeny, tiny little houses. What's not to love about that? And this, my lovelies, is my unravelling. Bugger. AKA I have totally dropped and unravelled some stitches! Can I please confess to just dumping my knitting when this happened a few days ago? I simply went into a blind panic. Somehow I haven't dropped a stitch before. But in my panic I actually dropped the stitch/stitches over a few rows. I know repairing it has something to do with crochet hooks and the like, but can someone point me in the direction of a good tutorial? I'd be eternally grateful! 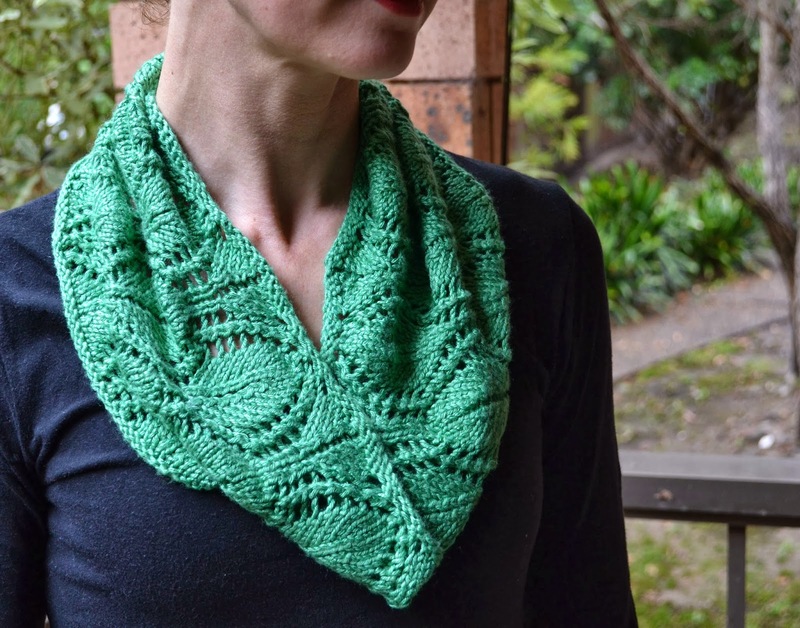 My emerald green Noble Cowl (Ravelry link) by Emily Kausalik, knit in Ella Rae Bamboo Silk (70/30). Soft, silky and deliciously drapey. I actually finished this back in August, but just never got a chance to photograph it. Today however is a wet, unseasonably cold Sunday and seemed the perfect time to get this gorgeous piece out again. I love the open lacework and the slouchy feel. It makes for the perfect mild weather accessory, offering a little warmth, a whole lot of style and punchy colour. I usually wear this with my bird brooch gifted to me by some wonderful work colleagues. You could make many wishes on the dandelions in my top. This top represented a few more firsts for me. Yay! Number one, first time using a Japanese pattern book. I've always loved the styles in these books but struggled to envisage how they'd work on my body. I'm slim but also taller (167cm) than the average Japanese woman (160cm) for whom the patterns are drafted, and the general sack-like look does little to flatter me. But this top, the front cover design, caught my eye straight away and I love it! It's very me. 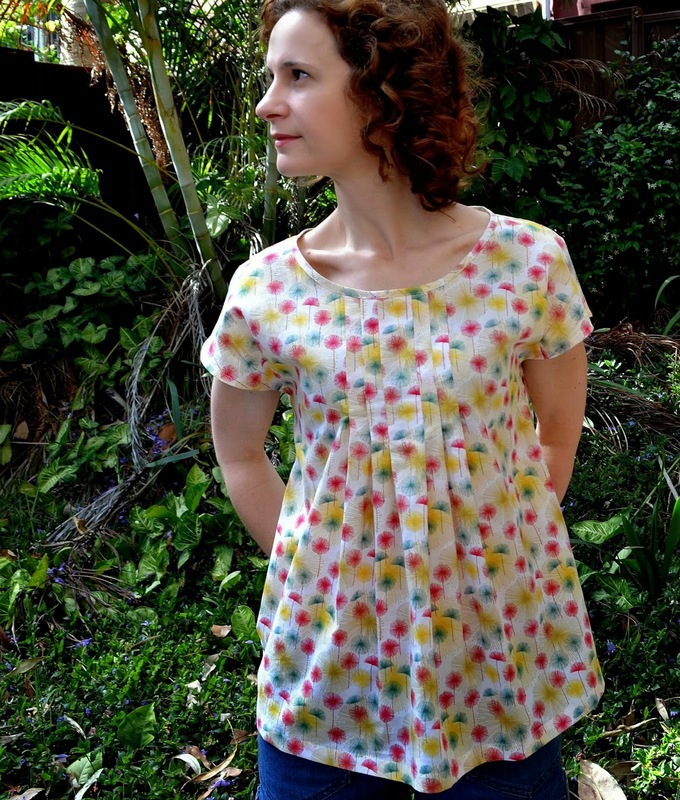 This is my version of vintage Simplicity 7155 (dated 1976). This is actually a pattern for a toddler's long "jumper" or top, and I believe is really made for layering over a t-shirt or blouse (as pictured). Why? Because the size 3 is really large on my 3.5 year old, especially in the arm scythes, and as a result through the chest area. It is a tieback dress which cinches out some of the fullness, but it still looks way too big... Is this just another one of those damn "ease" issues? Enough of excessive ease Big 4's! But apparently it's perfect for twirling!! !